Ever since the final version of iOS 5 dropped a week ago, the developers have been hard at work smoothing out the bugs on all the classic tweaks we know and love ready to be released into their new home. Additionally, there has been a lot of work put in to enhancing the new features, and IntelliScreenX falls directly into that category. The Notification Center was undoubtedly the newbie that drew the biggest sigh of relief when Apple announced features of iOS 5 at WWDC ’11. Thankfully, we no longer have to contend with the array of unsightly, disorganized popups beset upon us and have a nice, organized portal from which to deal with all those calls, texts, e-mails and the like. As has been the case consistently and oft to the annoyance of consumers, the Cupertino company has missed a trick, creating a void which IntelliScreenX has sought to fill. For once you have downloaded and installed the tweak, your lockscreen becomes your new, improved, easily-accessible one-stop for notifications. IntelliScreenX streamlines the notification experience with many, many new features. For me, the pick of the bunch is the "top shelf" feature, which allows quick access to features such as Bluetooth and Wi-Fi as if it were a trainee SBSettings. The above is just the clincher, though, there are numerous minor (yet collectively major) adjustments which render IntelliScreenX a virtual must for any organized techie. The good news is that the Beta version of IntelliScreenX is available today for public testing on Cydia’s http://www.intelliborn.com/isxbeta repository, with a v1.0 dropping sometime next week. Certainly something to look forward to. 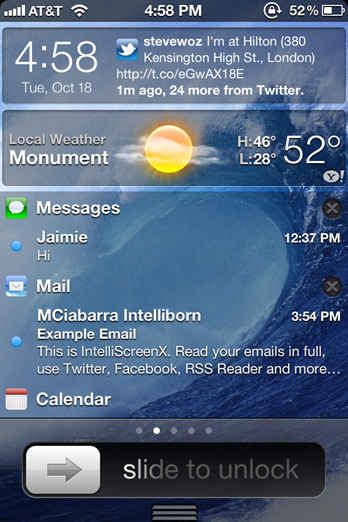 An iOS device jailbroken on iOS 5 is obviously needed for this tweak. You can follow our step by step guide posted here to jailbreak your iPhone, iPad or iPod touch on iOS 4.3.5 using Redsn0w (or PwnageTool). For jailbreaking iOS 5 tethered using Redsn0w, you can follow our complete step by step guide posted here, or here if you want to use Sn0wbreeze on Windows. Since jailbreak on iOS 5 is currently limited to tethered boot only, you can install ‘SemiTether’ patch (instructions here) from Cydia to make your jailbreak semi-tethered on iOS 5.